Wednesday March 30th 1881 The boys all went away last night but Mr Stone. Art & Will & Charlie Russell have gone home for good and Day went with the Pentzer boys for a few days visit. I worked all the forenoon to clean the upper story and Hatt cleaned up the parlor and the back part of the house. Ella Robinson and Carrie Sale spent the afternoon and evening here. Ott and Mr Funk who is visiting here went home with them. I finished the shirts in the afternoon and knit in the evening. 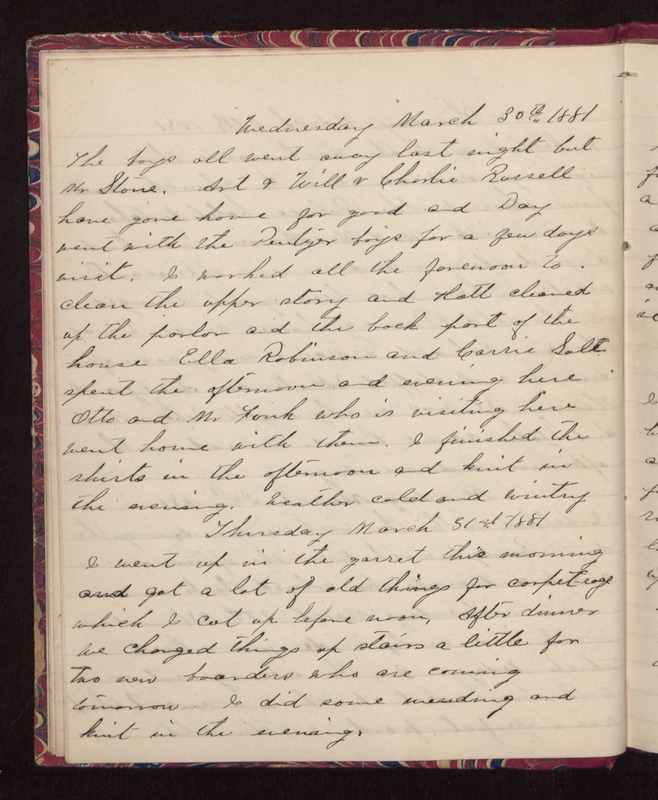 Weather cold and wintry Thursday March 31st 1881 I went up in the garret this morning and got a lot of old things for carpet rags which I cut up before noon. After dinner we changed things up stairs a little for two new boarders who are coming tomorrow. I did some mending and knit in the evening.